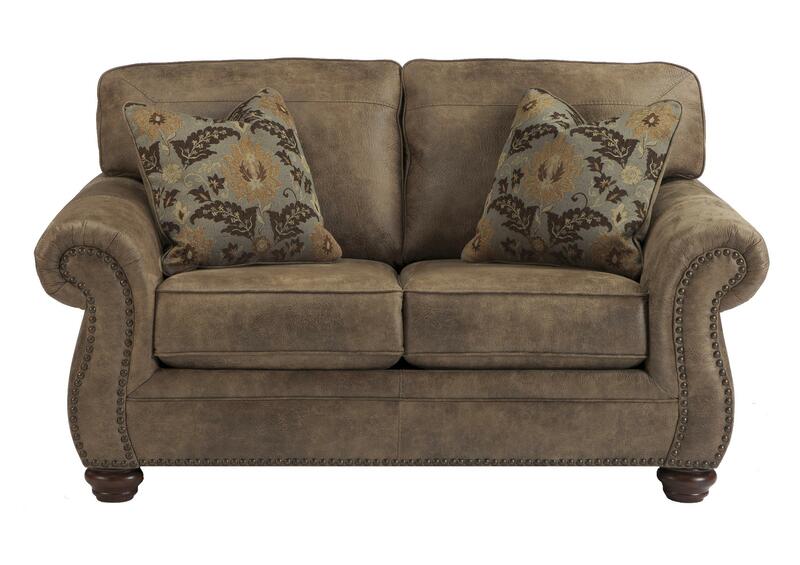 The traditional style of the Loveseat provides the perfect place for a couple to cuddle up in comfort and style. The Loveseat invites you in with the plush cushions and two decorative throw pillows adding depth and texture. The Loveseat is covered in a leather-like fabric adding a luxurious touch with jumbo window pane stitched detailing. 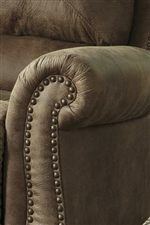 The traditional style is seen throughout with large curved roll arms, nailhead trim and exposed bun feet. The Loveseat pairs well the Sofa creating a refined living room that you call home. The Larkinhurst - Earth Loveseat w/ Nailhead Trim by Signature Design by Ashley at Miskelly Furniture in the Jackson, Pearl, Madison, Ridgeland, Flowood Mississippi area. Product availability may vary. Contact us for the most current availability on this product. Fabric Content 95% Polyester & 5% Pu. With a classic traditional style, the Larkinhurst collection will enhance your living room with a refined and sophisticated touch. The collection features the right seating options for any living room to feel complete. The Larkinhurst collection lends a luxurious feel with the leather-like fabric that is in a light brown tone making it compatible with any style and décor. 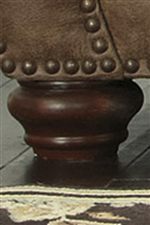 Traditional elements are seen through the large rolling arms detailed with nailhead trim, bun feet and patterned pillows. The Larkinhurst collection is sophisticated and stylish with a warm inviting appeal making your living room feel like home. The Larkinhurst - Earth collection is a great option if you are looking for Traditional furniture in the Jackson, Pearl, Madison, Ridgeland, Flowood Mississippi area. Browse other items in the Larkinhurst - Earth collection from Miskelly Furniture in the Jackson, Pearl, Madison, Ridgeland, Flowood Mississippi area.